Yoga is the only form of exercise that forces my personality to completely disconnect from the world and focus on me. My first exposure to yoga was in 2011, when I attended a Bikram Yoga class in New Hampshire. I wish I could say that, that was the moment when I became a yogi, but sadly it wasn’t. At that stage in my life, I was running a million miles an hour growing a business and wanting to be present for my young family. I simply did not allocate the needed time for myself. That’s not to say that I did not make time for exercise, in fact, quite the contrary. I made a lot of time for weight lifting and high intensity cardio. If someone were to take a snapshot of my typical day, it was racing to the gym to lift the heaviest weights I could, doing some form of intense cardio, running off to my business and dealing with all the challenges that every entrepreneur faces, racing home to wolf-down dinner and then trying to spend as much time with my family before the day ended. Whew! I didn’t know it at the time, but I was exhausted by the end of the day. When I moved back to Buffalo in 2015, after living away for 12 years, I made a personal commitment to “slow down” a little and to enjoy the journey of life. 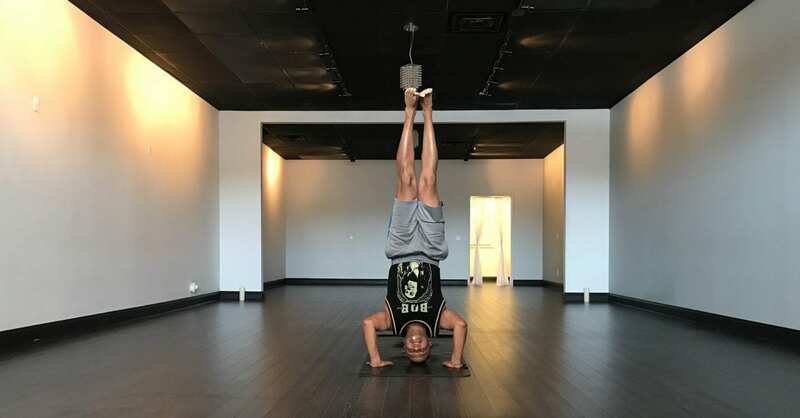 I decided to give yoga another shot and tried a couple of studios in the area. At the time, I was also looking for a sense of community and belonging, mainly because I was “new” to the area. My practice became a little more regular, but not as much as I wanted it to. I also did a lot self-reflection and realized that the reason I was not really focused on my practice was because I was de-motivated by the story that I was not really good at yoga. This was most likely the competitive side of me surfacing and discouraging me. If I wasn’t good at it, why would I want do it? I learned about Mind Body Flow Yoga through Carly. We had an office next to each other and Carly spoke highly of MBFY and encouraged me to give the studio a try. 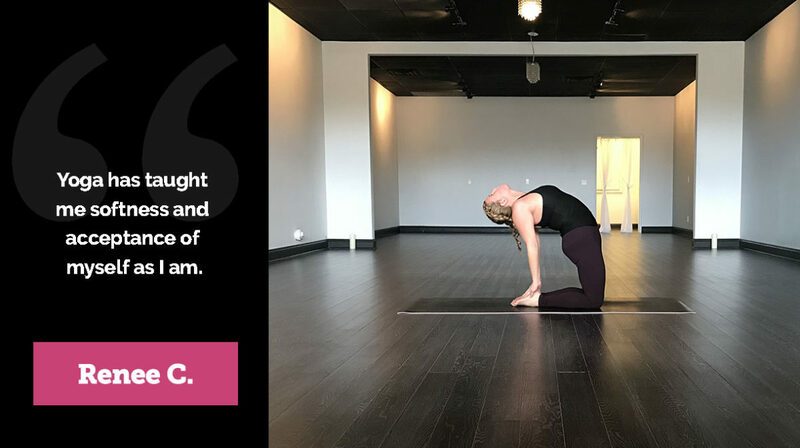 Within days of internalizing this article and taking to heart Carly’s encouragement, I walked into Mind Body Flow Yoga and took my first class. I felt a great sense of community and knew this was the place for me. It was then that I decided that I really wanted to further my practice. I even set a goal towards achieving wheel pose and tripod headstand, with small consistent steps. These two poses had always intimidated me, but I was finally ready to conquer them. With the help of all the wonderful instructors and Marina’s awesome motivation, I can proudly say that I am now able to perform both of these poses. Yoga for me today is my source of peace, inspiration and creativity. Peace because it is the only form of exercise that forces my personality to completely disconnect from the world and focus on me. Inspiration because Marina and all the awesome instructors share such powerful anecdotes of actual life. I am happy to report that my wife has also embarked on a yoga journey at Mind Body Flow Yoga. If you were a fly on our wall at dinner-time, you will often hear either myself or my wife say (depending on who went to yoga that day) “so what was the message at MBFY today?” These discussions are helping our family (including our two sons) create better versions of ourselves for each other. The reflection that got me to say “yes” and graciously accept the recognition of being the featured student of the month, was when Marina shared that saying “yes” does not mean that you become a “yes” person, but more so, that you need to learn the dance of saying “no” to certain things, so that you have the opportunity to say “yes” to other experiences. 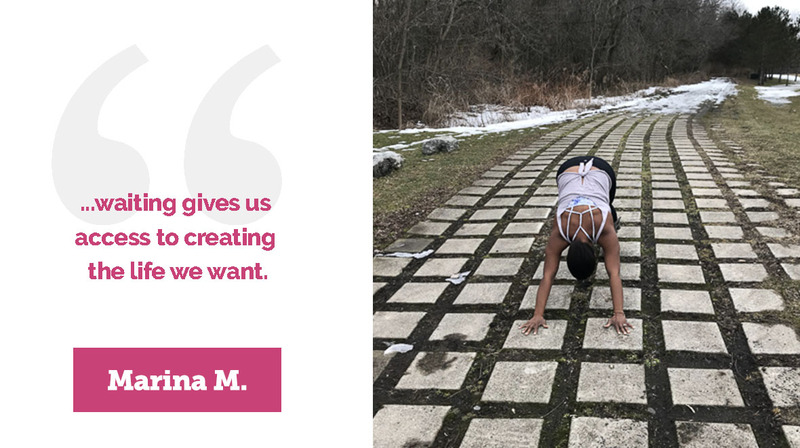 Creativity because my best ideas for my business, speeches, and solutions to any of my challenges, tend to flow into me shortly after yoga. Thanks MBFY, for the peace, inspiration, creativity and of course the sense of community. What is Tripod Headstand Pose About? This is a grounded upside down balancing pose. The resulting shape is a deep opening through the arms, legs, and spine. Watch above as Francis enters into this asana from Mountain Pose (Tadasana). He will exit the pose and land back in Mountain Pose (Tadasana) as well. Here are a few things to keep in mind, if you decide to try this pose, or if you have already started to experiment and play around with it. Walk the feet in to shorten the stance of your Downward Facing Dog. Pick up the right leg bending the knee and place it lightly on the right triceps. Bend and place the left knee on the left triceps as well , so you’re in a tripod. Instead of letting the weight bear down on your arms, keep the triceps engaged by pushing them into the knees to resist the weight. This will help you keep the shoulders lifted as well. Take a deep breath in and lift your knees off the triceps. Lift the hips up as the thighs draw tight to the chest. Stay as compact as possible to help your center of gravity and core engage. Every few breaths remind yourself to lift the shoulders and keep the elbows in. Once the hips stack over the shoulders, the weight of the legs will lessen and the core will engage. Squeeze in through the lower belly to lightly pull the knees off the arms into a pike position in your chest. Keep the inner heels and big toes touching as the legs draw up towards the ceiling. Feet are flexed powerfully. Hug the inner thighs to the midline, expand through the backs of the kneecaps and spread the toes. 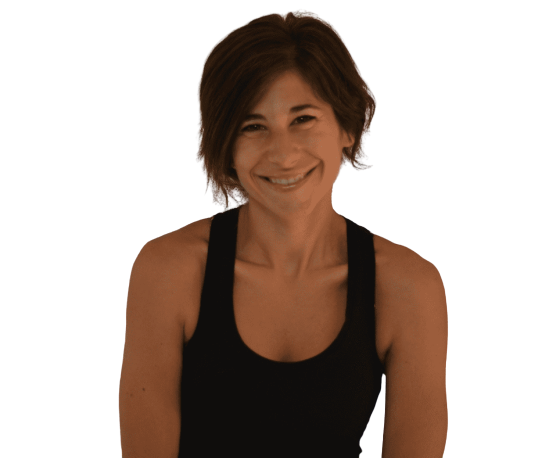 From here you can reverse the process back into Child’s Pose or keep the feet flexed, keep the body strong like plank and float into Chaturanga. Use caution with this pose if you have a back injury, headache, heart condition, high blood pressure, menstruation, neck injury, or low blood pressure. Pregnancy: If you are experienced with this pose, you can continue to practice it throughout your pregnancy. However, don’t take up the practice of this pose after you become pregnant. Have you tried this pose before? What has been your experience?